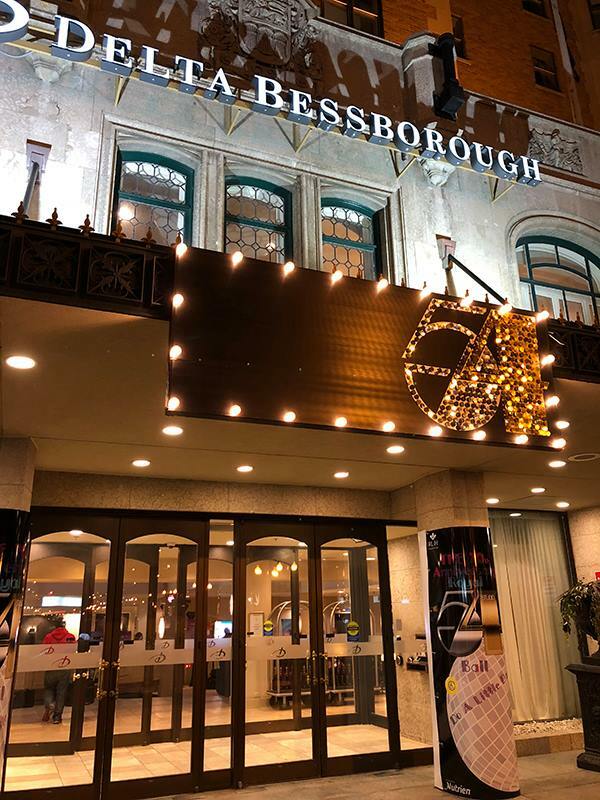 On October 13, 2018, at Delta Hotels by Marriott Bessborough, Novatex Graphics continued its annual support of the RUH Foundation’s annual gala. This fundraiser for one of the local hospitals here in Saskatoon raises money such things as specialized education for its doctors or for new equipment for various departments in the hospital. This year's proceeds are dedicated to a Trauma Observation Unit for patients that no longer require the Intensive Care Unit, but still need around-the-clock observation. The RUH Foundation gala is a black tie or costumed dinner and ball with Silent Auction items and a raffle. Each year has a specific theme, and this year’s theme was Studio 54. The annual gala is always a blast and gathers support from many sponsors, including Novatex Graphics, for a wonderful cause. Novatex Graphics started out as the sign sponsor for RUH Foundation Gala. We supplied signs designed by an Ad Agency, but after our second year, we jumped at the opportunity to take on the design of everything from the Save the Date cards and invitations, to the program and, maybe most importantly, to design the sign and display elements which help to immerse the attendees in that year's theme. This is now the 5th year we've been in charge of these aspects. This year's theme was Studio 54 so we wanted lots of shiny elements. The Save the Date cards were printed on a silver paper and the Studio 54 logo was highlighted with a raised gloss clear UV ink. We followed through on these with invitations that were printed with metallic gold and paper with a printed disco ball physically attached to the front and this was opened up to the inside of the invitation. However, we had the most fun with the sign elements for the event. Henry decided that he wanted not just shiny elements, but shiny elements that moved, so we purchased 30mm sequins which would be attached to two of the signs. 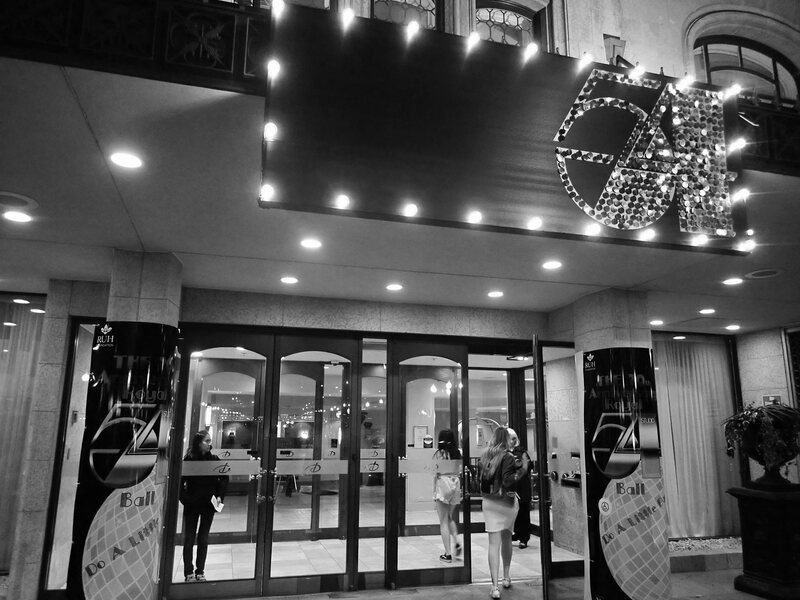 The first sign was a Studio 54 marquis sign for the outside of the hotel. It was built out of black coroplast and shaped like a sign can so that it would withstand the inevitable winds of Saskatchewan. Gold and silver sequins were applied onto the coroplast with pins and the pins were then glued at the base where they met the coroplast, allowing the sequins to move freely so that the sign shimmered in the breeze. We then put lights around the outside edges of the signs so that it could be seen at night. 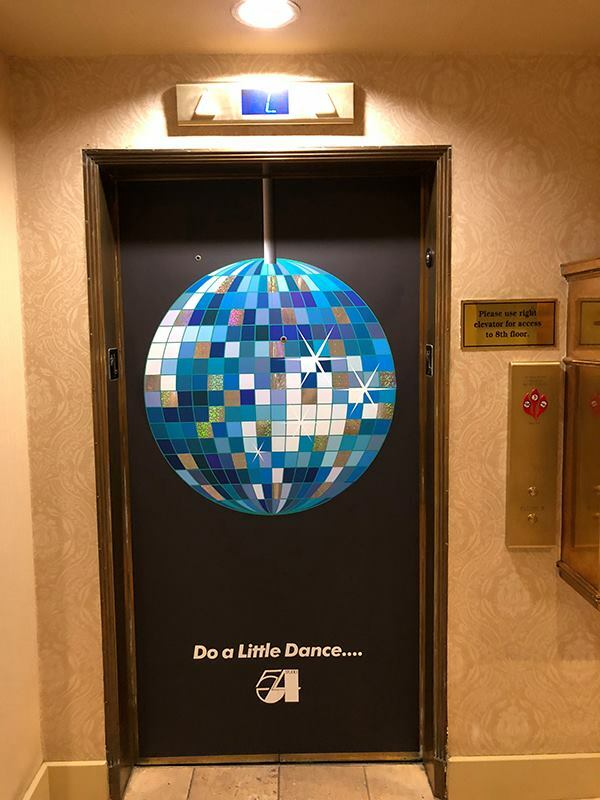 The elevators inside were wrapped with the Studio 54 logo and disco balls, with the centre elevator having a large disco ball with holographic vinyl accent pieces that shone in the light. 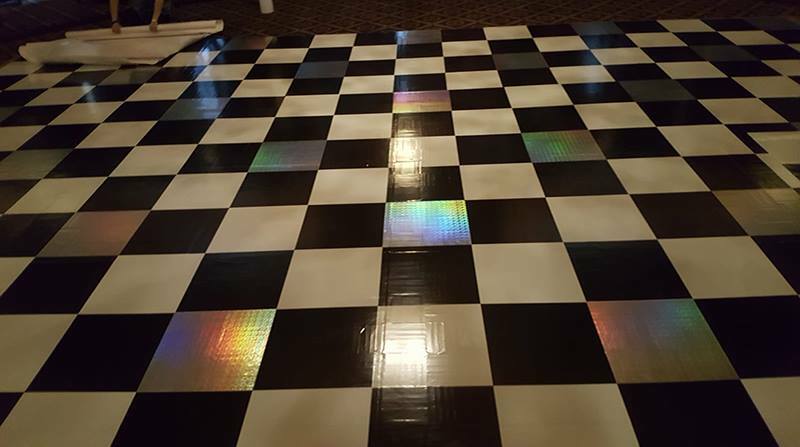 Once guests arrived at the Ballroom, they saw a black and white disco floor but with holographic vinyl inserted into some of the squares so that it caught the disco lights. 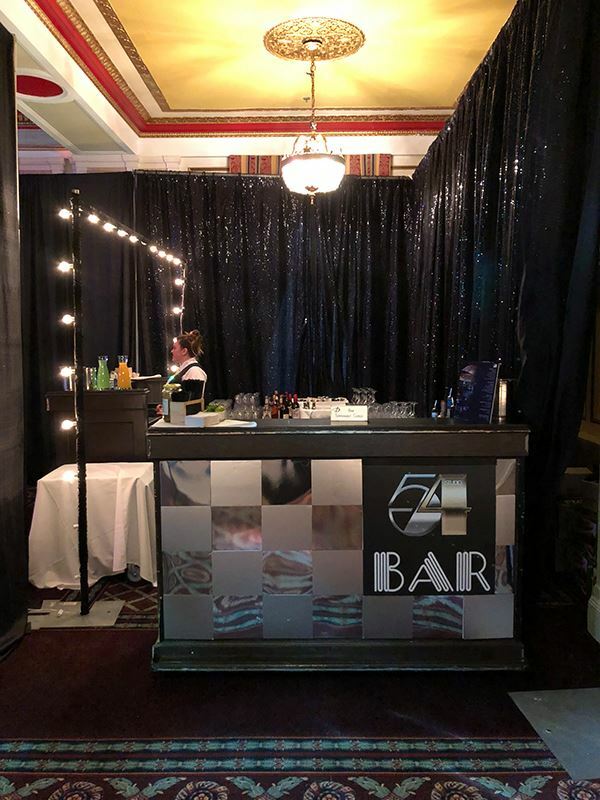 We also made Studio 54 bar fronts where we took mirror-finish polyester and laminated it with gloss or matte laminate. The matte laminated pieces were applied to 3mm foam board and cut into rectangular pieces. The glossy pieces were left as is but cut into the same size as the matte ones, and then we applied alternating pieces onto styrene, leaving room for a small Studio 54 sign in the upper corner. 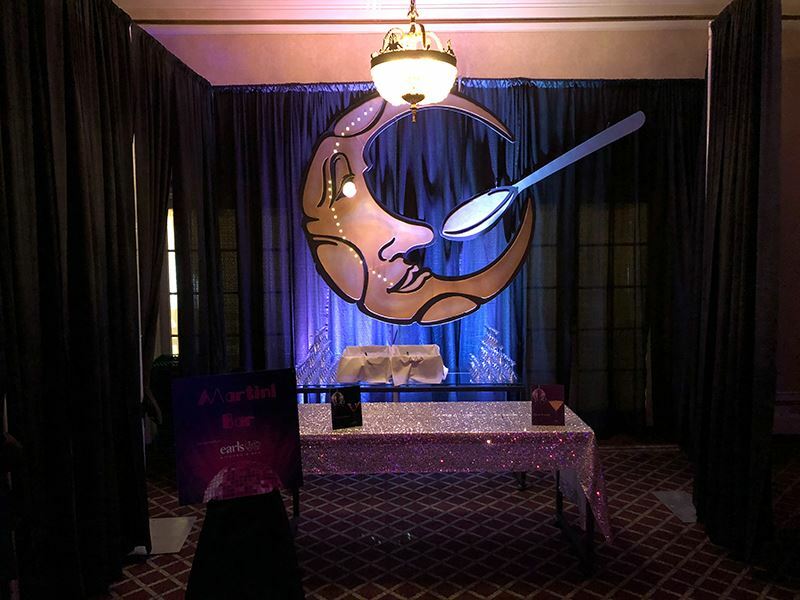 We also made a 3D lighted backdrop for the martini bar - a moon and spoon - that was based on an actual sign in Studio 54. 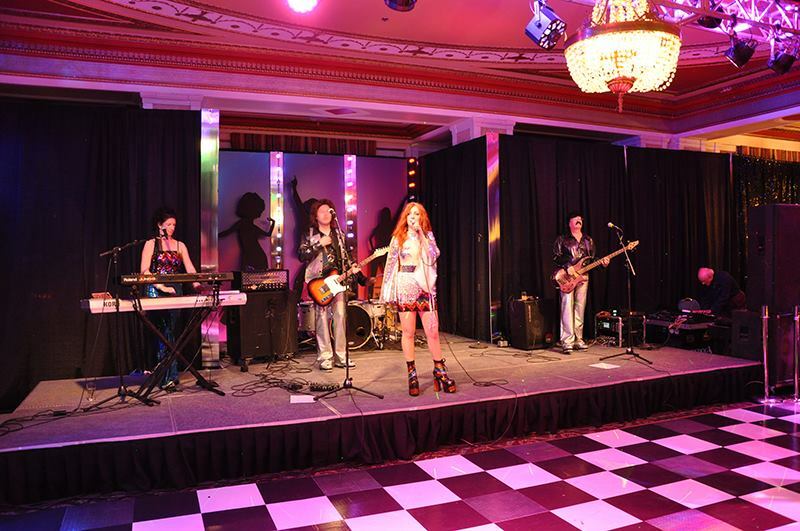 Novatex Graphics also designed and built a backdrop for the band which consisted of flat panels in psychedelic colours with 3 8' tall foam core silhouettes applied to them. 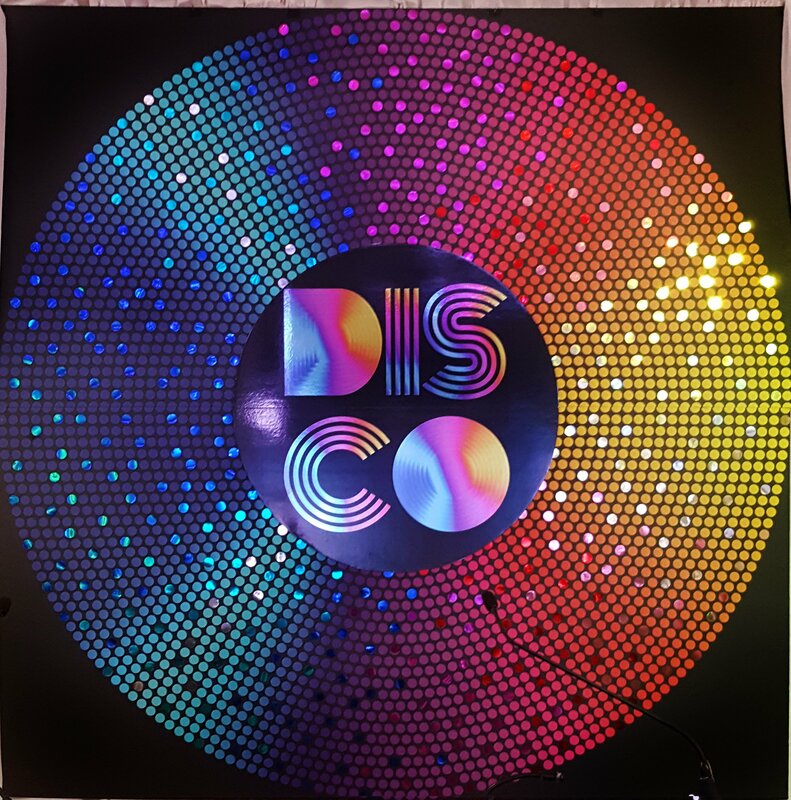 The backdrop was highlighted with 8' strips of coroplast laminated with mirror silver polyester so that the disco lights shined off of them in various colours. In the ballroom, we created an 8' by 8' disco sign for the podium. This piece was printed, but we glued coloured sequins onto a selected few dots that comprised the pattern so that they caught the lights used in the ballroom and they gleamed. The centre of the sign was a 3' disc that had "DISCO" printed onto mirror silver polyester so that it also reflected some light. Around the ballroom were 7' black foam core silhouettes which were lit up. As sponsors, we got to attend the event and we were very pleased with the final results. We believe RUHF and the guests were too! The RUH Foundation ball is held yearly and tickets can be purchased at RUHF.org. Keep an eye out on their website for next year's theme!